If for what ever reason you have ended up with a couple of Twitter accounts over the years, whether for personal or business, there will come a point that you will start thinking about needing to merge the 2 accounts. Unfortunately there is no official way in Twitter to take 2 accounts and to fully merge the historic tweets, followers and messages. Often though there will be one account that is being used as the prime which is the one that needs sorting. For nearly a year now I have been actively involved in Ripon Rugby Club, starting out helping get a decent web presence back online, to becoming the Communication Officer and on the Senior Committee, as well as the Fundraising Committee. As part of the increase in awareness and communication that we are putting in place we have a growing Twitter following and this is what my challenge was today. The club had 2 accounts. 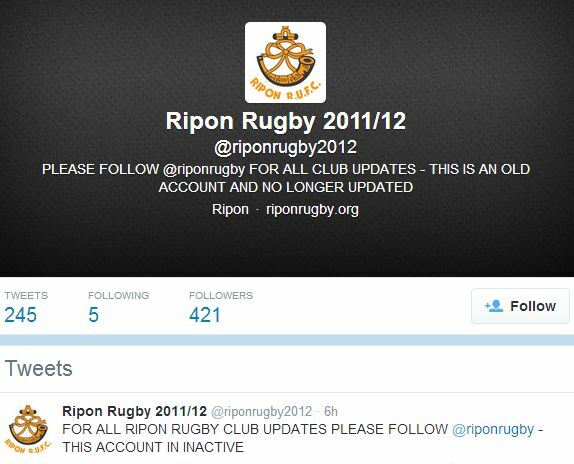 @riponrugby which was defunct, not posted on since 2012, set up by people not really involved in the club anymore, but has 418 followers and is a good Twitter handle. It was still collecting followers and tweets even though I had posted to push people to the active account. 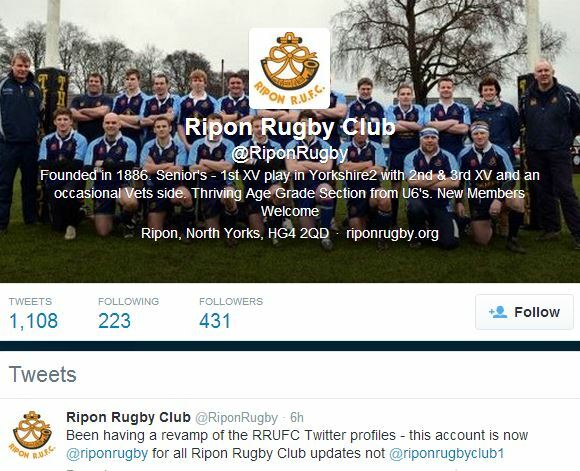 @riponrugbyclub1 which has sprung up in the last year or so, is an active account, has 426 followers .. but isn’t particularly memorable in its name. So the goal was to turn @riponrugbyclub1 into @riponrugby. This is the process that I went through. 1. Open 2 browser windows such as Chrome and Firefox and log in to each account. 2. I made sure that each account had a seperate email address, which was one of mine as I would need to verify the account at some stage so I altered one of the email addresses. 3. Verified the email address change so that we were all set. Now the Twitter name that I wanted to change @riponrugbyclub1 into was already taken so I needed to free up the name. 8. Then I was logged in as the new @riponrugby and checked the people that were following the account and followed a few back that would be useful to keep up to date with, and then next I went to the @riponrugby2012 accounts and went through the old followers on that account and followed anyone relevant from the @riponrugby account. 9. Next I contacted all of the parents of the age grade members that make up a large proportion of the club and informed them of the change in the Twitter account, as well as updating both the websites. 10. Next up will be a short News item on the main club website to spread the word and a couple of notices up at the clubhouse. Hopefully this will do it … and we can move on with the better Twitter handle for the future and people will get used to the switch quite quickly. 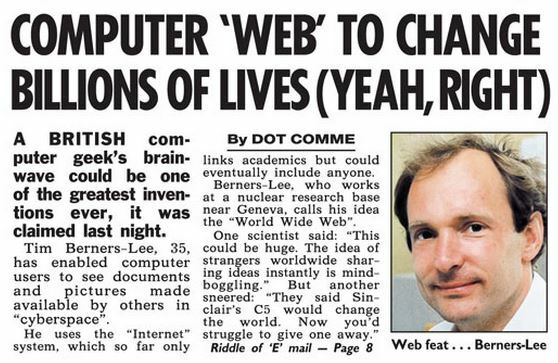 So it was 25 years ago today on the 12th March 1989 that Sir Tim Berners Lee proposed a system for sharing information between computers using a series of nodes that would form a “web” which would over the years turn into the world wide web and the internet as we know it. Today is certainly a day for celebration of a system that has totally transformed the way we do everything, whether it’s all for the good is a different matter, and the message that is coming over today in the media is that we should keep a free and open internet but that tighter security and some controls need to be brought in to protect the system and the users. From my point of view the more we rely on something like the internet to communicate and share, gather and send information the more at risk we are of serious devastation should a group or individuals decide to attack it in some way. We already see the disruption when the banks get hacked or DDOS attacked taking the sites down, or if personal data is hacked and stolen. We rely so much on the internet, I can’t quite figure out where it will be in 5 years’ time let alone another 25 years. I am lucky enough to have seen life before and after the internet … unlike my kids who think this is how it’s always been. Same with things like mobile phones .. I didn’t have one of those until I was married and now my kids are walking around with iPhone 5’s! When we went out as kids we didn’t text to say where we were, we just had a time to come home. Back in 1989 I was only 14 … but the internet that was being invented then was going to take a decent amount of time to actually start being used my “normal” people. I left secondary school after doing my A levels, to go to University in 1993 and there was no sign really of the external world wide web. We had an intranet within Uni but only very simplistic. I remember going to Uni and the sheer panic that my first assessment had to be typed up, in a specific font & font size, double spaced, and then printed out for the tutor. What … for me that was a steep learning curve of how to actually work the computers in the IT block and use WordPerfect. As kids we did at one stage, when I was about 12, have a ZX Spectrum with an adjoining tape drive that we could load amazing games like Daley Thompson Decathlon and bash on the keyboard to make him go faster. I also remember a weird skiing game too. There was then a computer when we got a bit older at home but it was more of a work machine, stand alone, running off 5.25” floppy discs and tapes and hooked to a ginormous Phillips daisywheel printer. There was no reason for us to use the computer as kids and there was nothing really to do on them. It was amazing how much we did to entertain ourselves without being transfixed to an Ipad or laptop soaking in huge amounts of junk that is out there. And how addictive it seems to be for my kids at least that I have to limit their time on the internet glaring at a really rubbish YouTube video of some idiot. I don’t think I’m the only one out there who battles with their kids to bring themselves back into the real world. I’m lucky though that my kids love rugby so they do spend a large amount of time over the weekend outside, playing rugby and getting muddy. I’m not quite sure where I am going with this post apart from that I do love the Internet … I went to University with no clear idea of what I was going to do as a career, then left University (1996) to join a company in the purchasing department where all transactions were done over the phone or via the post/fax. After 9 years in purchasing ending up being the Purchasing Manager we had moved more onto the web for ordering parts but still quite phone based, but email was much more prominent. Between 1998 and 2003 there was a big lift off and a steady embracing of the internet across many sectors. You only need to go back 16 years when we got married in 1998 to see how different things are. All the organising and preparation was done in person, by letter or over the phone….and on my wedding day when my parents went to the wrong venue at Gretna Green we didn’t have mobile phones to make a quick call, you just had a time and a place to meet. I left my purchasing role in 2005 to run Bronco which was already reaching its 2nd birthday … so the internet had certainly taken its hold on me. In the 11 years we have been running Bronco we have seen a huge change take place in shopping habits, customer behaviour and how we all share information and keep in touch. It’s a bit scary what the next 25 years will hold, and I can’t imagine what sort of world my future grandchildren will live in. 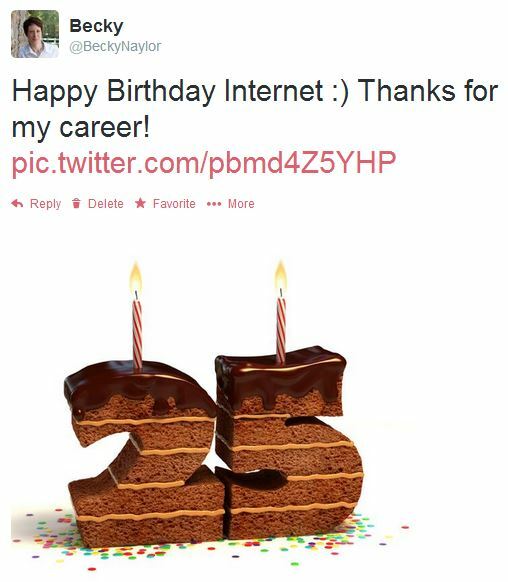 But Happy Birthday Internet thing!